30 Days of Practice – you did it!! 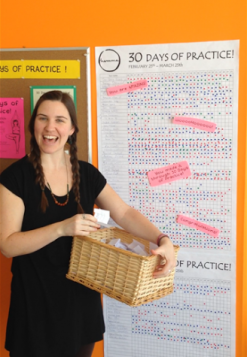 HUGE CONGRATULATIONS to all who participated in 30 Days of Practice from February 25th – March 25th, 2016!! Its incredibly inspiring for us to witness you setting your goals, sticking to your practice, and experiencing the power of a daily practice. Whether it was all home practice, studio practice, or a combination, your grand prize is the momentum you have gained from this commitment to yourself. Many of you also entered your name into a draw for a 1 month pass – and the winner is….. Kathleen Boland! Congratulations to all.